It started with his curiosity about the addictive power of computer games. Poh Yeang Cherng, director of Kingmaker Consultancy – a company which specialises in media literacy and cyber wellness- experiments with the games himself, going as deep as possible “without falling off the edge”. He is also one of the pioneers of the cyber wellness movement in Singapore that started around 2000. He has three children, aged 10, eight and two. During the interview, the two elder daughters busied themselves with making konnyaku jelly; while their little brother, among other cute antics, played with his “yellu car”. Not once, did any turn on the television nor seek a handphone or the like. Yeang Cherng takes reference from the American Academy of Pediatrics’ recommendation of no screen time below two years old. He adjusts it based on his own experience in counseling and observation of the individual child’s tendencies. He also applies restrictions on media use early but gradually relaxes it as the child learns self-control and responsibility. A complementary and often more effective intervention is active mediation, where parents go through the activity with their children, explaining the implications. The parent can also just watch the media alongside the child – what is known as co-viewing – but special note must be taken to not inadvertently convey that negative values and behaviour are overlooked. It is also important to provide alternatives. 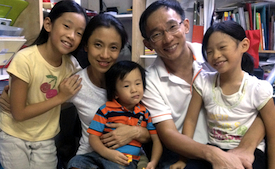 Yeang Cherng ensures that his children read well and enjoy other healthy activities such as play-acting before he exposes them to the computer. With good habits and hobbies established, children will not have difficulty tearing themselves away from the engaging digital worlds. Noting the “race for the children’s minds”, he does not leave it to the school nor peers to teach his children how to use social media. So before they reach Primary One, he began coaching his children on how to engage a social media platform, surrounding them with a positive online community as best as he could. Yeang Cherng describes the two ends of a range of approaches: one espousing the need for exposure for media literacy; and the other, more conservative and wary of the dangers. The right approach depends on the child and the circumstances. Even in one family like his, he adopts different stances. The elder daughter, being more compliant, could be encouraged to explore more; while the younger daughter who tries to break loose more, might need closer supervision. He highlights that if the parent does not know the context and blindly applies someone else’s rule, the results can be disastrous. Through his many workshops, he has found that about 65% of the classes are made up of mums and only 35% dads. Yeang Cherng notes that mothers are usually more involved than fathers but mums cannot replace dads. When dealing with teenage boys in particular, mums may not be able to cope. Fathers are not just stronger but they are in a better position to exercise authority. It is also important for the parents to ensure consistency and agreement between themselves. More awareness and education is still needed for parents, children and teachers. A sizeable group among the parents in their 40s are not as conversant in the new digital technologies, and even among the parents that embrace the technology, some are not aware of the inherent subtle manipulation. “When I choose a game, I look at the content and mechanics…how they are going to condition the child,” Yeang Cherng says. Unlike Angry Birds, where one can get bored but just as easily pick up the game again at another time, Massively Multiplayer Online Role-Playing Games (MMORPG) are designed to make it harder to give up as you play more. At the start, it is easy to become powerful, and at levels where players are likely give up, something new opens up. For example, in Maple Story, the player only gets out of the main island beyond level 10. Also, as the character becomes more powerful with investment of time and energy, walking away from it seems too much of a waste. “Why ever build a virtual presence that is so compelling?” Yeang Cherng wonders. Games also induce spending. Many of these games require multi-tasking, so after a while, it can get painful to use time to achieve a certain objective and money comes in –players buy what they want to advance themselves in the game. Even educational games deserve closer scrutiny for advertising and behavioural conditioning. Furthermore, while educational games have a lot of potential, the current outworking has been patchy. Yeang Cherng recounts how the model answers to his daughter’s online assignment were wrong! Postscript: Yeang Cherng regularly shares updates on media issues for children on Kingmaker Consultancy’s Facebook page.